The strategic plan, rewritten in March 2011, calls for eleven objectives all designed to help reduce casualties (injuries and fatalities) in recreational boating. 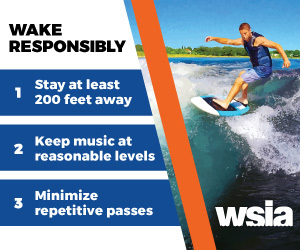 The Water Sports Foundation remains today as WSIA’s educational arm and has become a highly regarded U.S. Coast Guard boating safety advocate with the likes of the National Safe Boating Council (NSBC), National Association of State Boating Law Administrators (NASBLA), and the American Boating and Yachting Council (ABYC). More information on the WaterSports Foundation’s work with the U.S. Coast Guard can be found on the nonprofit grant recipients’ page of www.USCGBoating.org. The Water Sports Foundation is governed by the officers of the Water Sports Industry Association and is a Florida corporation. For more information please contact Larry Meddock, Executive Director at 407-251-9039.